YouTube has announced that it is adding automatic subtitling to its videos thanks to automatic speech recognition (ASR) technology. The move is to make it easier to create captions for videos. While manual captioning has been on the site for a while, the rollout of ASR tech means that it takes the pain out of putting subtitles on to a screen. There are now two ways to do this: Auto-timing and Auto-Captions. To utilise Auto-timing, you have to upload a transcript of the video in text form and YouTube will turn this into synchronised captions. The second way is Auto-captions. This is being used of a range of the site's channels, including the National Geographic, Demand Media and most Google channels. Here the ARS will transcribe the audio and put it into subtitles. 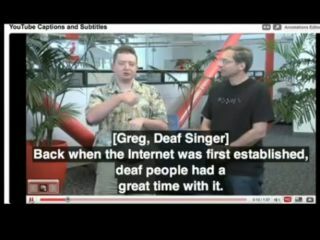 Although this technology is still in its early stages, YouTube has big plans for it, with a goal of "making video accessible everywhere (web, mobile, TV) and to everyone (other countries, languages, alternative access modes)."